The North Plan is enjoying a successful stage run in Vancouver right now with Catherine Lough Haggquist among the cast highlights. Here's a look at what Vancouver critics are saying about The North Plan and Catherine Lough Haggquist. "Under Chelsea Haberlin’s direction, the performances are uniformly strong. Genevieve Fleming is deliciously committed to the volume and repetition that Tanya deploys to compensate for her lack of perceptiveness. Daniel Martin’s Berg is tortured equally by his dangerous knowledge and by the increasingly slim chance he’ll be able to do anything with it. 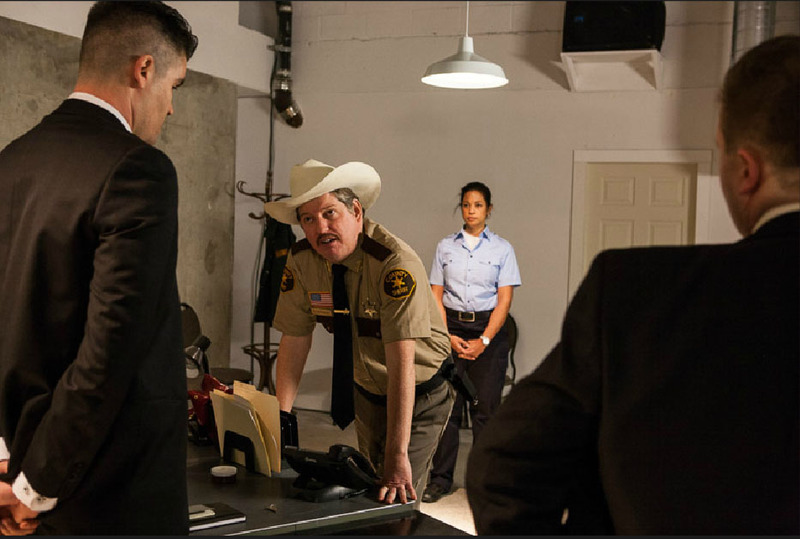 Both Paul Herbert, the suspicious small-town sheriff, and Catherine Lough Haggquist, as a desk officer who can’t make up her mind whose side she’s on, are grounded counterpoints to the desperation of their prisoners. Allen Morrison and David Mott round out the cast in the second act as a pair of federal agents with some issues to work out." "I had misgivings about going to a play in a site-specific location that was hard to find. I thought it might be small and insignificant and not worth the trouble of going out on a cold night. Boy, was I wrong!" "We soon meet Shonda Cox, an “administrative officer” sent to calm the hysterical Tanya. Catherine Lough Haggquist is perfectly curt, tough and sensible in this role." "I can’t remember laughing so hard and being so unsettled at the same time – in equal measure. In writing The North Plan, American actor/playwright Jason Wells was responding to his discovery of the Main Core, described in his words as, “a database system containing information on millions of American citizens marked for surveillance or detention. Evidence suggests that Main Core has been used often for unwarranted surveillance in the last decade or longer, suggesting that a “national emergency” is even more nebulous than most of us would have supposed.” Bill C51, anyone?" "Catherine Lough Haggquist is Shonda, the long-suffering cop whose job it is to watch prisoners Carlton and Tanya. And it isn’t easy because Tanya never shuts up. If there’s a limited arsenal of f-bombs on the planet, Tanya uses them all up in the space of a couple of hours." "Directed by Chelsea Haberlin, The North Plan manages to make a strong political statement without bullying the audience into taking a particular position. Wells manages to infuse hilarity, and often absurdity, into his stage play which helps ease the weight of the topic’s complexities. In addition, although the characters personality may be somewhat over-the-top, they are well developed and their actions are believable. For instance, the administrative officer, Shonda (Catherine Lough Haggquist) appears to be strong, fair, and diligent while also being empathetic. When one of the Homeland Security officer’s begins giving her demands and tells her to go home, Shonda refuses until her police Chief returns and explicitly tells her to do so. Shonda is not sure Carlton will be safe with the officers if she leaves and wants to ensure someone will be there, even if it cannot be her. Although she is a bit fearful of what could happen if she “disobeys” the orders of Homeland officers, her response of refusing to leave is realistic." "The North Plan starts with a conspiracy theory and ends with its very antithesis: laughter. When you consider topics like freedom of information and national security threats, rarely does humour ever come into the conversation. To be honest, for the first half of the two-part play, I thought North Plan’s ideology would overcome entertainment value. After all, the fundamentals aren’t so hard to grasp, as it’s something that we’ve all heard repeated across popular literature and in the media: a big, bad quasi-government organization out to muzzle whistleblowers and subdue the population for nefarious means. Now onto the cast of six, all who must shoulder the weight of our collected suspended belief. All acquitted their roles well, taking turns playing serious characters and providing comedic relief as the balance of power shifts. Catherine Lough Haggquist’s administration assistant goes through one of the biggest personal transformations, from resigned sidekick to equally reluctant co-conspirator. Haggquist adds levels to the role, at times level-headed, others passively belligerent, that make her moments of frantic action truly explode." The North Plan runs until November 29th in Vancouver. Buy tickets through Theatre Wire! © 2013-2018 Catherine Lough Haggquist. All rights reserved.